Me&Ev, as in, ever notice daughter is 1 letter away from laughter? If you asked me yesterday at breakfast if I've ever had a musical gig that paid me money, I would have: a) thanked you for even thinking the question; b) laughed; and c) said "nope". But. Had you asked me at lunchtime, you'd have gotten a "yup." First you have to know I enjoy travelling on my motorcycle and although you can't tell by looking, I frequently sing while I ride. 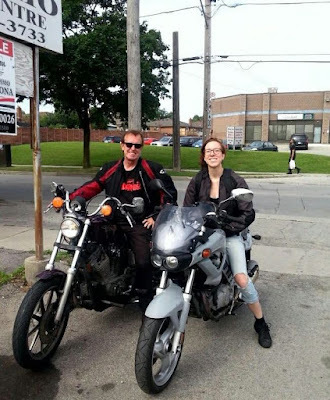 My motorbiking daughter Ev does too-- a fact I added as an excuse to use this picture. I have a limited repertoire of motorcycling songs but I admit that one is the '60s hit, "Born to Be Wild," written and recorded by a Canadian band called "Steppenwolf" in 1968. 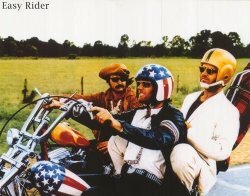 The thing about "Born To Be Wild," is that it became the unofficial theme song for the movie "Easy Rider," starring Peter Fonda who--I'm just stating a fact here--I've been told I kinda look like. And Peter Fonda rode a Harley-Davidson. Which is the brand of bike I currently own. The model of Harley I have is called Sportster and until recently the Sportster was the littlest Harley-Davidson going. When Sportsters first appeared in the late '50s, they were considered very cool but that's changed. One clever writer described the transformation thusly: When they were introduced, people knew a Sportster was the kind of bike The Fonz would ride. Now it'd be Potsie. Still, it's big and fast enough for me. Besides, I seriously don't care what kind of bike I'm riding. I've never been on a motorcycle I didn't like. And I digress. Tuesday morning, I was roaring along Toronto's Lakeshore Blvd, belting out "Born to Be Wild." "Like a True Nature child,," I sang, "we were born born to be wild fly so high never wanna die-ie-ie. Born to be Wi-i-i-i-ild" and like that. That's when I recalled my money-making singing gigs. When I was a little kid, before Easy Rider made the song famous, I used to go over to my lifelong friend Trevor MacIntyre's house. There was a guitar there. Neither of us knew any chords though I just this minute remembered Trevor took drum lessons. I banged on the guitar; Trevor and I would sing the phrase "Born to Be Wild"over and over and over again as loudly as our little pre-pubescent voices would let us, and his father would pay us to stop.